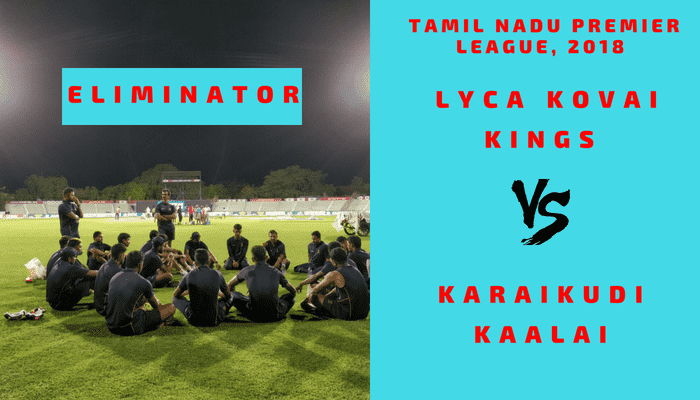 Lyca Kovai Kings is all set to take on Karaikudi Kaalai in Eliminator on Thursday, August 09, 2018. LKK is at 3rd position and KK is at the 4th position of the points table. In Today’s Dream11 Cricket Match Prediction of LYC vs KAR, Eliminator, TNPL 2018, we will cover Fantasy Cricket News and Tips, Toss Prediction, Pitch Report of NPR College Ground, Dindigul, Probable Playing 11 and Who Will Win? Who Will Win the Eliminator T20 Match, Between LYC vs KAR and Toss Prediction? Where Can You Watch the Live Streaming of LYC vs KAR, Eliminator or Channels to Watch? Idream Karaikudi Kaalai has lost their last two matches and Lyca Kovai Kings has won their last four matches back to back. Both the teams have won 4 games out of 7. Both the teams have an equal chance of winning. According to our astrology prediction, LYC will win today. The team winning the toss should opt to bowl first as batting first will be a difficult task as compared to batting second. According to our astrology prediction, LYC will win the toss and ask KAR to bat first. Match: Tamil Nadu Premier League, 2018, LKK vs KK, Eliminator. If you look at the previous matches played on this ground, scoring runs in the first half was difficult. It will remain the same for this match also. The pitch will favour the bowlers in the first half and it will be difficult to score runs. The batsman can take advantage in the second half. Overall the wicket will favour all three departments. Rain is expected in the evening. It will be partly cloudy at the time of the play. It is expected to be a hot and humid day. The temperature is expected to be 29-Degree Celsius and the humidity to be 54%, which may go up to 66%. Note: The weather is expected to favour the Fast Bowlers. If we look at the last four matches, LYC has won two matches out of four matches whereas KAR has won one game out of four games and one match was a tie. In the last encounter, the match was tied and LYC won the match in the one-over eliminator. Abhinav Mukund, Shahrukh Khan, Ashwin Venkataraman and S Ajith Ram are the key performers of Lyca Kovai Kings Team. LYC will play with the same playing 11 until and unless there is any fitness issue. Ravi Kumar Rohith (wk), Krishnamoorthy Vignesh, Abhinav Mukund (c), Prasanth Rajesh, Ashwin Venkataraman, T Natarajan, S Ajith Ram, Shahrukh Khan, S Manigandan, Antony Dhas, Muhammed Khan/Akkil Srinaath. Ravi Kumar Rohith (wk), Krishnamoorthy Vignesh, Abhinav Mukund (c), J Suresh Kumar, R Sathyanarayan, Akkil Srinaath, Shahrukh Khan, Suresh Babu, Ashwin Venkataraman, Sumant Jain, Prasanth Rajesh, Antony Dhas, S Manigandan, Muhammed Khan, Pradosh Ranjan Paul, S Ajith Ram, M Raja, T Natarajan, R Mithun. Srikkanth Anirudha, V Aditya, Maan Bafna and Yo Mahesh are the key performers of Karaikudi Kaalai Team. KAR may play with the same team until and unless there is any fitness issue. Ashwath Mukumthan, Maan Bafna, Yo Mahesh, M Shajahan, Srikkanth Anirudha (c), R Rajkumar, Rajhamany Srinivasan, R Kavin (wk), S Mohan Prasath, S Swaminathan, V Aditya. Rajhamany Srinivasan, Srikkanth Anirudha (c), T Ajith Kumar, R Kavin (wk), Dinesh Karthik, V Aditya, Velidi Lakshman, Maan Bafna, S Kishan Kumar, M Shajahan, P Murgesh, Ashwath Mukumthan, R Rajkumar, S Ganesh, Yo Mahesh, S Mohan Prasath, S Swaminathan, S Radhakrishnan, L Suryaprakash. Fantasy Cricket Expert Tips: Both The players are good but you can select Ravi Kumar Rohith. 81.77% of the users have selected Ravi Kumar Rohith in their Dream11 Teams and 18.23% of the users have selected R Kavin in their Dream Teams. Make a combination of the above players for multiple teams. Conclusion: This is it for Today’s Dream11 Fantasy Cricket Match Prediction of LYC vs KAR, Eliminator, which will be played on Thursday 9th August. We have covered all the details required to win any fantasy leagues. We have covered players recent and past performance, dream11 guru and crictom prediction, all the latest news and updates of Lyca Kovai Kings Team and Karaikudi Kaalai Team, weather report of Tirunelveli, dream 11 best teams, keys players, the best choice for captain and vice-captain, where to watch the live match of KAR vs LYC, Eliminator and the details of live streaming of Tamil Nadu Premier League (TNPL), 2018.